Sweet potatoes on the barbecue? Give it a try. 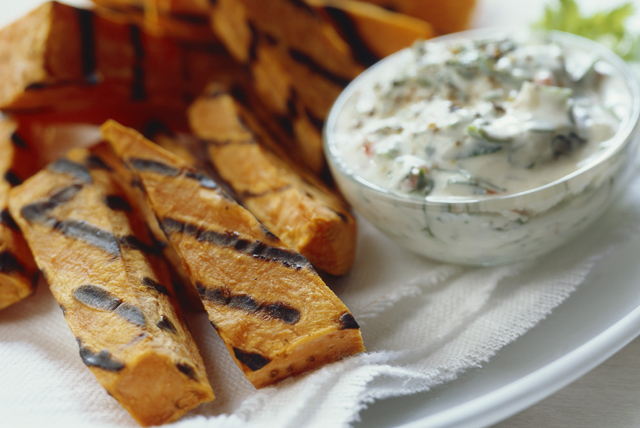 This simple recipe turns regular sweet potatoes into a delicious grilled appetizer. The combination of sweet potatoes and the spinach-ranch dip is perfect. Place potatoes in microwaveable dish. Add water; cover. Microwave on HIGH 5 min. ; drain. Cool 5 min. Meanwhile, mix spinach, sour cream, onions, cheese and 1/4 cup dressing. Toss potatoes with remaining dressing. Grill 10 to 12 min. or until potatoes are tender and golden brown, turning occasionally. Serve potatoes with spinach dip. When recipes call for cooked spinach to be "well drained", this means the excess liquid must be pressed or squeezed out. Use clean hands to squeeze out portions of the spinach or place the spinach in a sieve and press on it with the back of a large spoon.